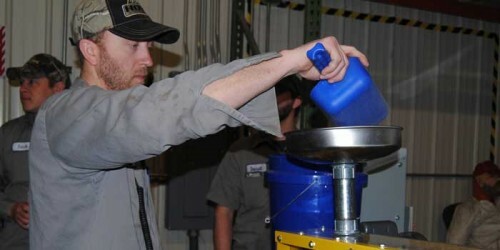 Two employees demonstrate a separator that rids soybeans of such debris as dead or live mice. 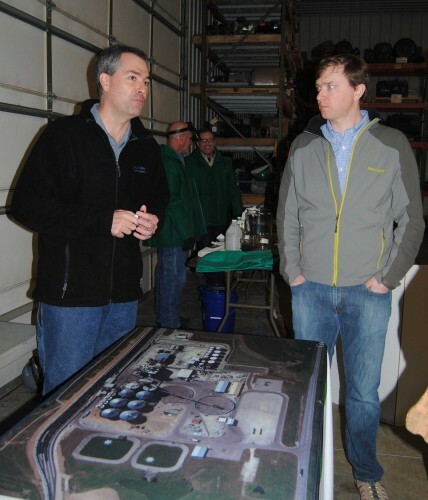 Louis Dreyfus Commodities in Claypool had its seventh annual Global Safety Day Thursday, March 10. 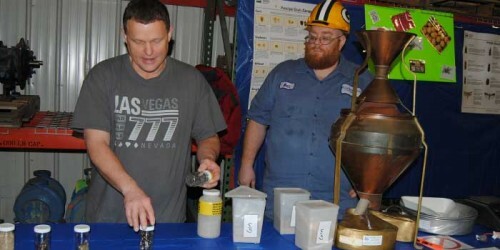 CLAYPOOL — Louis Dreyfus Commodities in Claypool had its seventh annual Global Safety Day Thursday, March 10. Employees and contractors learned about safety incentives and programs. The focus was simple — the basics of safety — with the same message for employees, contractors and those who do business with LCD. Safety is the No. 1 priority at Louis Dreyfus. This is why each year one day is set aside for a safety presentation in every facility throughout the world. Safety ensures productivity, reducing operational loses, damage to assets and equipment. Officials said the whole business is a team sport. “The results are good. We are down 20 percent in reported accidents. The results are encouraging,” said Kurt Anderson of LDC. Globally, there were some major incidents last year. One was a fire in West Africa. These could have been prevented, Anderson said. “We are creating a safer work environment,” added Sean Doyle, manager, North American Oilseeds, Louis Dreyfus Commodities, LLC. LDC’s goal is to ensure employees go to work safely and go home safely. Management stressed the importance of identifying risks before accidents happen and putting plans in place. This can include making sure safety measures are in place, so that the workplace is safe. Locally, at the Claypool plant, the highest percentage of injuries were slips and falls, with 72 percent. A small percentage were strains, chemical injuries or “struck bys.” There were 10 accidents last year. Officials said the company needs to also look at at-risk employees and make sure they are being watched. Four safety awards were also presented. LDC also has an employee recognition program. An employee can earn points for safety and proactive behavior. LDC is investing in safety. Last year, the company spent $881,000 in SHE capital spending. SHE stands for safety, health and environment. “Everyone here is focused on SHE,” said Dave Selig, LDC, Claypool, plant manager. The crowd of about 105 people learned about new safety incentives and programs. An upgraded fire alarm system and noise barriers are some safety initiatives being planned. 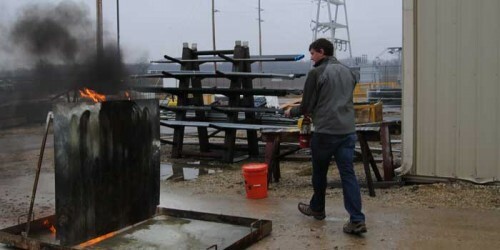 After an hour-long video presentation on safety, employees and contractors took part in and watched several different safety demonstrations. Lunch was also provided. Phoebe Muthart has been The Papers Inc. since 1999. She has won numerous awards, including several from Hoosier State Press Association.